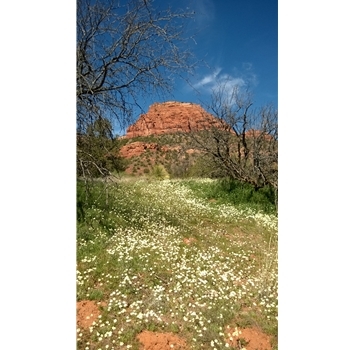 Features and Interests: Unparalleled Sedona views, along with San Francisco Peaks bonus, with some unique geology. Trail Description Note: This is a difficult, unshaded hike. Do not attempt with snow or in summer heat. This out and back trail provides the finest views and geology of any hike we've done in Sedona. The trail starts on flat grasslands with wildflowers lining the spider web maze of erosion ditches. Within a quarter mile, you will start the trek up the Bear Mountain over 4 distinct climbs. The first climb is up the beautiful 350 ft or so orange sandstone which is topped off with a lighter Apache Limestone. This first climb is perhaps the most difficult as it's immediate and steep! The more level trail continues up to another steep ravine which is difficult near the top. Coming up the mesa like area, you will be greeted by Manzanitas atop the Coconino Sandstone. Don't forget to turn around frequently to enjoy the amazing views! Continue following the cairns to the first signs of pines. After a small descent, you will come up to a very fascinating multi-directional swirl of sandstone...beautiful example of geology in action. The cairns will take you to the right of this formation on a steep ascent with spectacular views to the right...watch your feet as the surface is quite uneaven! Beyond this sandstone lies the final ascent to the top of Bear Mountain. It's a technical climb to the top of the Kaibab Limestone island. Once on the top, you will see the San Francisco Peaks ahead and also the bulk of Bear Mountain past the saddle. Catch your breath, and come back the same way enjoying the never ending views.